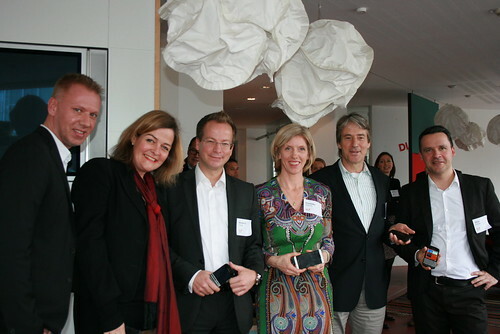 A diverse group of people from the DLD community, came to lunch at Hubert Burda Media in Munich. They discussed the topics surrounding smart computing and the future of work. The crowd of around thirty people was made up of editors, venture capitalists and technology experts. 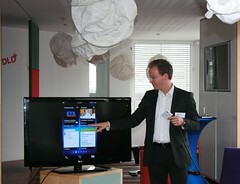 Markus C. Müller from Blackberry presented the new Blackberry Z10 and spoke about the developments in smart-computing. “The age of smart-computing has started”, he said. A Blackberry Z10 looks nothing like its forerunner; touch screen and flow interface turn it into a computer, rather than a phone with keyboard; but the Blackberry Z10 goes beyond a facelift. The device brings together private and professional life. The idea is to no longer need two smart phones; one professional, one private. The company wants to satisfy a demand, which has arisen from ever new and numerous technologies, that allow us to work and socialize no matter where we are. " We all have two personas", said Müller "one private and one professional." At the same time companies are interested to feel secure when employees share their professional content through the cloud and on mobile devices. The Blackberry Z10 is meant to satisfy both needs. After the presentation DLD guests continued a lively discussion on work/life balance and social communication.